Join this safari in Kenya to see the magnificence of its rhinos and brimming wildlife! The Rhino Watch Safari Lodge provides an ideal base for safari game drives, hiking, and nature observation in various parks and protected areas that surround it. These areas, which weren't renowned on the tourist map for a long time, are teeming with wildlife. Enjoy this location considered as one of the best places in Africa and see the Big Five! During this safari, you will stay in a shared double room. The first night will be spent in a guest house in Nairobi. The following six nights will be spent in an exclusive safari tent at the Rhino Watch Safari Lodge. The Rhino Watch Safari Lodge is situated in the central Kenyan highlands. The lodge offers a beautiful view of Mount Kenya. Surrounded by three wildlife reserves, the lodge provides an ideal base for safari game drives. Warm hospitality and a friendly atmosphere await you. The Rhino Watch Lodge is an oasis of peace and relaxation, a perfect place if you need to get away from it all. The lodge wants to promote sustainable tourism by attempting to minimize their impact on the environment. Its aim is to ensure that development brings a positive experience for the local communities by involvement and the generation of employment. In addition, The Rhino Watch Safari Lodge supports and contributes to the conservation of the animals and their habitat while showing its guests the beauty of wildlife and landscapes in a respectful way. The lodge has a gift shop, central dining, spa treatments and sauna, free Wi-Fi, a conference room, babysitting services, a children play corner, and wardrobes. Its pool is 15 meters long and eight meters wide with a breathtaking view to Mount Kenya. It has a baby pool which is 1.90 meters deep on the infinity end. During this safari, you will enjoy a location teeming with wildlife. You will get to see the Big Five and also enjoy some birdwatching. 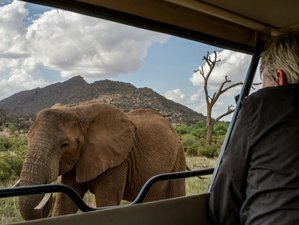 This wildlife safari will be held amidst unique, diverse landscapes and interesting cultures will make for a dream holiday. This program is developed for newcomers, families, and Africa lovers looking for new locations to explore. You will be welcomed in the evening at the Jomo Kenyatta International Airport (NBO). From here, you will be transferred to your guesthouse for a good night rest. After a leisurely breakfast, you will start your journey into Kenya's central highlands. Several stops on your way to the Rhino Watch Lodge are planned during this period. You will enjoy lunch at the Tana River, where wild tilapia that is freshly caught by local fishermen will be prepared for you on the spot. You will also visit one of the numerous colorful fruit and vegetable markets, where regional farmers offer their fresh produce. At the end of the day, you will arrive at the Rhino Watch Safari Lodge, which will be your accommodation for the week. During this day, you will enjoy breakfast, a picnic, and dinner. The third day features a safari trip in the Solio Game Reserve. The Solio Game Reserve is a fenced, privately-owned wildlife conservancy geared towards rhino conservation. The park plays a major part in the protection and breeding of black rhinos in Kenya. Breeding has been so successful that rhinos from Solio have stocked wildlife reserves all over Africa with young animals. A full day safari at this location will allow you plenty of time to observe these magnificent animals up close. Other wildlife includes buffalo, zebra, giraffe, oryx, antelope, Thompson’s gazelle, impala, waterbuck, and warthog. The park also offers some of the best leopard viewings in the country and lion and cheetah can also be found. Breakfast, a picnic lunch, and dinner will be featured on this day. The fourth day features giraffe and birdwatching. Located only 15 minutes from the Rhino Watch Lodge, a small private reserve which offers the opportunity to go on a game walk with giraffe, zebra, and antelope is located. This is a truly wonderful experience to spend the morning at. Back at the lodge you can spend the afternoon birdwatching from a raised platform, which will allow you the observation of many bird species that enjoy bathing in the nearby pond. Breakfast, lunch, and dinner are included during the day. The Aberdare National Park contains a wide range of impressive landscapes and is home to a great variety of wildlife. The main ecosystem within the mountain range is the rainforest, one of the last intact rainforest refuges in Africa, which gives way to dense bamboo forests and then moorland. Some wildlife more easily observed in this ecosystem is the forest elephant, buffalo, the giant forest hog, and some of the big cats, including leopards. The park also contains a large population of black rhino. The crystal clear mountain streams are teeming with trout. In this region, even the bird viewing is rewarding, with over 250 species of birds observed. Breakfast, a picnic, and dinner are included in this day. The sixth day is a free day at the lodge to relax from a wonderful but intensive few days and to spend time at your own leisure. During this day, you may go for a nice stroll on the property, enjoy some birdwatching, or read a book in the lodge's comfortable, quiet library while enjoying some refreshments on the veranda. Breakfast, lunch, and dinner are featured in this day. The seventh day features a safari in Ol Pejeta Game Reserve. Ol Pejeta is a mosaic of grass plains, wooded grassland, acacia woodland, and evergreen thicket extending for over 350 square kilometers. This extraordinary reserve is East Africa’s largest black rhino sanctuary. Besides black and white rhino, the park boasts an astounding variety of wildlife including non-indigenous chimpanzees that can be visited in the Sweetwater Chimpanzee Sanctuary, the Big Five, and some of the highest predator densities in Kenya. The combination of amazing wildlife and stunning views across the open plains will guarantee you an unforgettable safari experience. During this day, you will enjoy breakfast, a picnic, and dinner. After a week gone by too fast, you will be transferred back to Nairobi to catch your flight back home. During this safari, you will stay in the Rhino Watch Safari Lodge in Kenya's central highlands. Some locations where you will enjoy amazing game drives are the Solio Game Reserve, the Aberdare National Park, and the Ol Pejeta Game Reserve. The Aberdares are the third highest mountain ranges in Kenya. They consist of around 100 kilometers long from north to south. There are two main peaks, Ol Donyo Lesatima (3,999 meters) to the north and Kinangop (3,906 meters) to the south. The Aberdare National Park, with an area of 767 square kilometers, covers the higher areas of the Aberdare Mountain Ranges. This park contains a wide range of landscapes. From the mountain peaks that rise to 4,300 meters above sea level, to their deep, V-shaped valleys intersected by streams, rivers, and large cascading waterfalls. Herds of forest elephants and buffalo move almost silently through the undergrowth while overhead loud chirping birds, Colobus monkeys, and Sykes monkeys dominate the canopy. Other animals that are easily observed include the lion, the leopard, and the giant forest hog, which is almost twice the size as the normal warthog. Also abundant are waterbucks, reedbucks, duikers, and bushbucks. Rarer sightings include those of the golden cat and the bongo, an elusive forest antelope that lives in the bamboo forest. Animals like the land and serval cats can be found higher up in the moorlands. The Aberdare National Park also contains a large population of the black rhino. The crystal clear mountain streams are teeming with trout. And even the bird viewing is rewarding, with over 250 species of birds in the park. The national park can be explored with safari jeeps or on foot. The forests and moorlands have great hiking trails. This extraordinary reserve is located about 50 minutes away from the Rhino Watch Safari Lodge. Ol Pejeta is East Africa’s Largest Black Rhino Sanctuary and is home to 87 black rhinos. As one of the world's most endangered species, the care and protection of the black rhino is one of the largest operations of the Ol Pejeta Conservancy. In addition to the black rhinos, the reserve accommodates 11 Southern white rhinos and four of the world’s last remaining seven Northern white rhinos. The reserve is also home to a number of other endangered species including the locally threatened Jackson’s hartebeest and Grevy’s zebra. Dependent upon seasonal migration patterns, Ol Pejeta estimates a total of 300 elephants on the conservancy at a time. The conservancy incorporates corridors within its northern boundary fence to ensure wildlife connectivity to the greater Laikipia-Samburu ecosystem. These corridors allow free movement of all species on the conservancy -except for rhinos- and are used heavily by elephants. Also, the Ol Pejeta Conservancy holds some of the highest predator densities in Kenya with approximately 67 lions, 30 cheetahs, 20 leopards, and 60 spotted hyenas. Since mid-2011, there have also been frequent sightings of a pack of five wild dogs. Moreover, the Ol Pejeta Conservancy houses a chimpanzee sanctuary and it is the only place in Kenya where this highly endangered and remarkably intelligent species can be seen. The Solio Ranch is one of the finest wildlife parks in Africa, which hasn't figured on the tourist map for generations. The park is a fenced, privately-owned wildlife conservancy geared towards rhino conservation. The Solio Game Reserve was founded in 1970 when the owner of the Solio cattle ranch fenced off a large section of land and dedicated it to conservation. This park plays a major part in the protection and breeding of black rhinos in Kenya. The park entrance to this wildlife and nature paradise is located only five minutes away from the Rhino Watch Safari Lodge. In addition to the world's largest population of white rhinos and the near hundred black rhino, the Solio Reserve is inhabited by different other wildlife. The park also offers some of the best leopard viewing in the country and lion and cheetah can also be found. The Solio Reserve is also an ideal place for bird watching. The acacia forest in the middle of the reserve is traversed by a river that at times turns into a swamp-like area. This habitat is a paradise for birds. Including the more than 300 species that are found in the game reserve are the European rollers, flycatchers, and birds of prey such as vultures, eagle owls, Montagu’s Harriers, long-crested eagles and buzzards. Also crowned cranes and the European stork can be found here every year. Despite a concerning decline of lions in Africa, the lion population in the Solio Reserve has managed to stabilize itself in the last few years. Cheetahs, lions, hyenas, and leopards are mainly nocturnal hunters, which can make night observations during night an exhilarating experience. During this safari, you will be served daily delicious meals as indicated in the itinerary. Special dietary needs may be catered for with a prior notification. During your free time, you may enjoy reading a book beneath one of the Rhino Watch Safari Lodge covered lounging areas or take a dip into its infinity pool. Other activities you may indulge in at the lodge are a giraffe walk in a nearby sanctuary, a coffee safari, fishing, hiking to the Aberdares and Mount Kenya, or some biking. Kenya is a paradise for bird watching. Already around the Rhino Watch Safari Lodge, there are countless species of birds. These include endemic species such as the eagle owl. Also, the variety of birds of prey is enormous with fish eagles, Augur buzzards, crested eagles, snake eagles, and many others such as the colorful European rollers and starlings. The Rhino Watch Safari Lodge organizes tours for bird watching and hand-made safaris with trained bird watching guides for an additional cost. Please book your flight to arrive at Jomo Kenyatta International Airport (NBO). Transfer from and to the airport is included. Rhino Watch Safari Lodge will pick you up from the airport. The Rhino Watch Safari Lodge is an ideal base to experience the treasures of African wildlife including famous big 5, in 3 different parks around the lodge.